Ruggedized smartphones are usually considered fairly niche products that are aimed at those in industries such as construction or law enforcement, or any profession where the device is likely to take a hammering on a daily basis. Because of this, they don’t have the performance of many flagship smartphones, but they often come with unique features of their own. 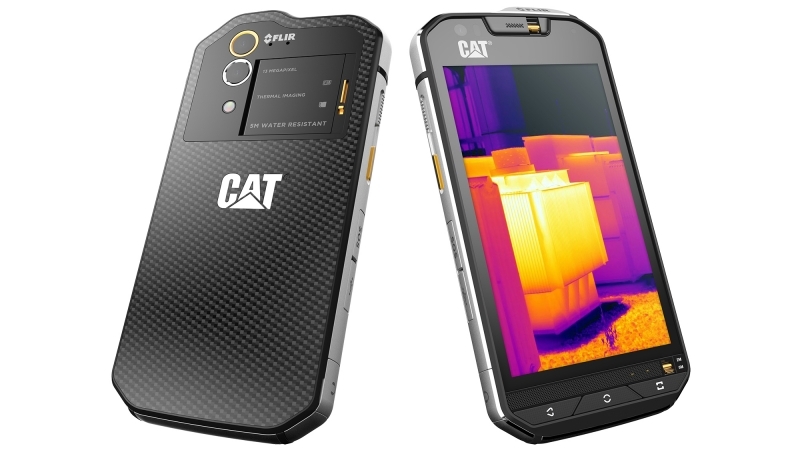 One example is the new Caterpillar S60, which sports a built-in Flir thermal imaging camera. Flir, which is one of the largest thermal imaging companies in the world, has integrated its Lepton sensor used in its thermal cameras into the body of the device, alongside a regular 13MP rear camera. The sensor is able to produce live images, measure surface temperatures, and can record both stills and video, although its resolution is limited to VGA (640 X 480). Cat suggests it could be used during search and rescue missions where people may be obscured by smoke, or for law enforcement to check tire temperatures. The S60 comes with Android Marshmallow and features a Snapdragon 617 processor. In addition to the 13MP rear camera, it also has a 5MP front-facing version, 3GB of RAM, 32GB of expandable storage, a 720p 4.7-inch display (with a peak brightness of over 500 nits) and a powerful 3800mAh battery. Closing off the device's microphone and earpiece openings make it waterproof down to just over 16 feet, where it can operate for up to an hour. This gives it the title of the world's most waterproof smartphone. Moreover, it can be used with both wet and gloved hands, and comes with a strengthened die cast steel frame that is designed to exceed the military’s 810G drop test specifications. Thanks to its reinforced body and 1mm thick Gorilla Glass 4 display, the S60 can be dropped onto concrete from over five-and-a-half feet and still be okay to use. The Cat S60 will be priced around $600 when it launches at the end of May.